The transverse abdominals (the deepest layer of the abs) tends to be a totally overlooked muscle. Well, at least until you have a baby. After that, you’ll realize the importance of the transverse. This muscle wraps around the abdomen like a corset, cinching your waist in while providing support for your lower back. The transverse muscle is directly connected to the diaphragm and the pelvic floor, playing a huge role in pelvic stability. This is also the muscle that gets massively stretched out while you’re pregnant as your baby grows and your belly expands. The transverse doesn’t always return to normal on its own after pregnancy, actually it often needs help. So, why is this muscle so important? Improve Posture. The transverse abdominals wrap around your waist like a corset providing strength and stability to the spine and lower back. Increasing transverse strength will allow you to correct common postural compensations brought on by pregnancy and as a result of carrying your little ones (i.e. that posterior pelvic tilt). Decrease Lower Back Pain. A weak transverse is often a contributing factor to lower back pain and is a leading cause of lower back pain in pregnant and postpartum women as the back muscles tighten to compensate for a weakened core. You Use Them in Everyday Life. Even if you’ve never been pregnant, the transverse muscle is super important. This muscle is a prime stabilizer of the torso as you bend, twist, and lift objects (i.e. your kids!) up off the floor. A strong transverse muscle will come to your rescue as you approach the physical activities of your daily life. Endure Longer in Other Exercises. Again, this one has nothing to do with pregnancy or postpartum fitness. But, it’s no secret that a strong transverse will aid you during any other type of fitness training. Performing exercises in proper form will support great advances in strength and endurance while improving your overall performance. You’ve probably heard a fitness instructor mention time and again to ‘engage your core’ during a workout class. And, if you’re pregnant or postpartum (could even be years later! ), you might have thought—“how do I know if I’m doing that?” Engaging the transverse is a very subtle experience. It is not simply sucking your stomach in. I, repeat, it is NOT simply sucking your stomach in. You could easily miss the engagement if you aren’t paying close attention. Once you master the transverse contraction, start including a lift of the pelvic floor with the transverse contraction and hold both together for a 2 count. 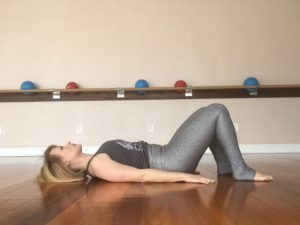 This will teach your transverse and pelvic floor to work together. Start focusing on engaging the transverse muscle and the pelvic floor before bending, twisting, and picking up your kids and over time you’ll begin feeling strong, balanced, and stabilized.